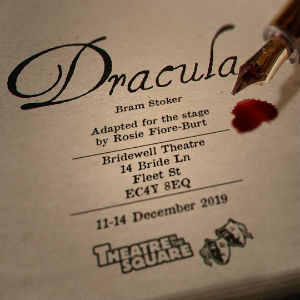 Rosie Fiore-Burt, novelist and playwright, is writing and directing an original adaptation of Bram Stoker’s Dracula, which will be performed at the beautiful, atmospheric Bridewell Theatre in Blackfriars from 11-14 December 2019. This ambitious adaptation will incorporate physical theatre, live original music, puppetry, masks and choral vocal work. Rosie will be bringing in experts to run workshops in different aspects of performance, and parts of the show will be devised and workshopped with the cast. This is a great opportunity for motivated, enthusiastic performers. We will all gain new skills and get to work with some amazing professionals. That said, it is also a big commitment. This will be an ensemble production, and we will need dedicated, reliable and enthusiastic participants who attend all rehearsals and give their all to the process. If you think this is something you’d like to be involved in, please come to our pre-audition workshop from 2-5pm on 11 May 2019. Rosie will talk about her vision for the project, we will do a movement and vocal exercise workshop and read some of the script. Formal auditions will be held at East Finchley Methodist Church, 205B High Rd, Finchley, London N2 8AN , at 7.45pm on 21, 23, and 24 May. Contact Rosie with any questions info@theatreinthesquare.org.